Made with recycled content this environmentally friendly recycler with its sleek contemporary half moon design is a great space saver. 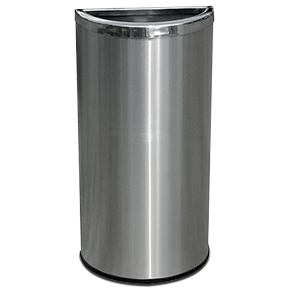 Constructed of heavy-gauge steel; the Precision Series Half Moon waste container is designed with a flat side to fit snugly against any wall. Equipped with a removable 8 gallon galvanized liner for quick and easy maintenance. Rubber guard on base protects the floors and helps to keep unit securely in place.